I don't know about you, but I am always tweaking. Always. Not much stays the same in our house for very long. Christmas decorating has been no exception. The dining room has had the most changes so I thought I'd share them. Here was my Dining Room Christmas Tour just a week ago. And now... Can you spot the differences? The chandelier got a few new decorations. The gold ones were 30% off from Myer and have the words Joy, Peace and Noel in the centre of them. The white balls I made from crepe paper and glitter. I saw them in a shop for $12 each! I made exact replicas for 50 cents each! For the large wall sign, I cut another piece of MDF I had spare and inserted it in the current frame. I cut the corners off the new sheet so it can be removed easily. The wording I simply printed off the computer and transferred. I love that I can also do something on the other side and change it up again for different occasions. The paper chain was a DIY from last year made from old music sheets. The large door wreath was $10 at Spotlight. I just added some pinecones I already had and hung it on the door with jute webbing. I also changed up the ornaments in my glass display cabinet to a more white and silver colour palette. All the orange baubles and red holly were put away for another Christmas. Top 10 Projects for 2013! Christmas 2013 Lounge Room Tour! 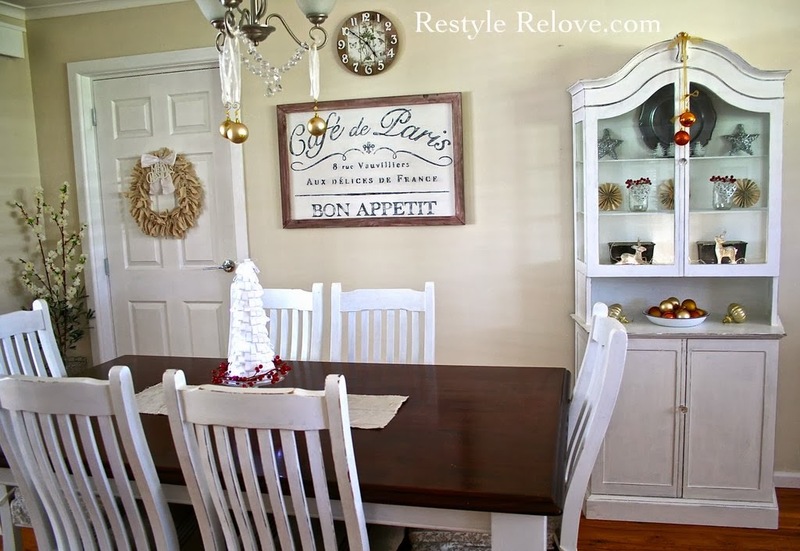 Christmas 2013 Dining Room Tour!